The Preview Icon is invaluable to testing the booking page and ensuring that availability is showing as expected. You can also use it to book real events. Preview is located at the top left corner of the Appointlet dashboard. 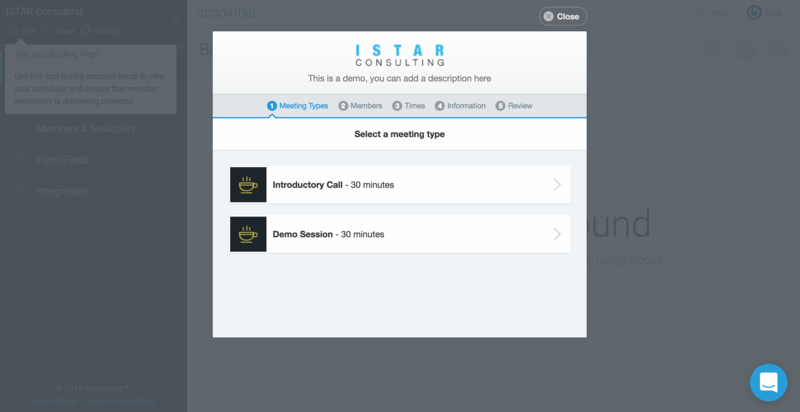 Whenever you make changes to your organization's meeting types or member availability, it's a good idea to hit Preview and confirm that your schedule is displaying as expected. We have found that organizations who test regularly when making updates to the account are the most successful users. Otherwise, configuration errors can go unnoticed for months, leading to limited or non-existent availability when people come to view your booking page. Clicking the preview icon will keep you inside of the Appointlet application and open your booking page as an embedded popup. The events you schedule with this tool behave in the same way that your client bookings do. The only difference is that you are scheduling from within the app, rather than on your booking page.